Our friendly, helpful front desk staff warmly welcomes you 24 hours a day and will help you get settled into our inviting guestrooms where you will find a variety of complimentary amenities including WIFI, HBO, and a mini-refrigerator. Guests may use the computer and printer in the lobby. The front desk staff will be happy to send faxes or scan and email documents for you. Our 54 non-smoking guest rooms are heated and equipped with a ceiling fan and a portable fan, perfect for the mediterranean climate of Santa Cruz. Fresh coffee, fruit and bakery items available each morning and are included in your room rate. 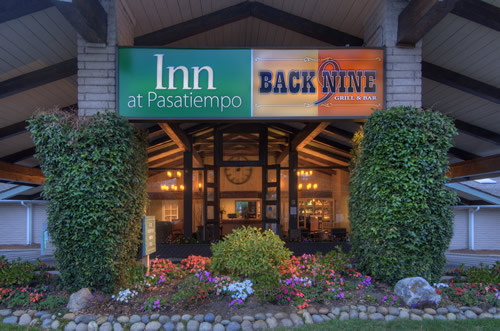 The hotel lobby and Back Nine Grill and Bar have been recently renovated and offer an inviting and comfortable place to enjoy a glass of wine by the cozy fire. Please click here to see our current special offers. Discounted room rates are available to guests booking with the hotel direct. Please contact us at (831) 423-5000 for more information. Valid credit card and ID required upon arrival. Minimum age for check in is 18 years. 11 percent VAT and 1.50 USD Countywide Tourism Assessment tax and a floating CA Tourism Tax are not included in the room rate and are subject to change without notice.